Well, I think it’s obvious. You are carrying the Rage virus but aren’t infected yourself…. Are your irises normally different colours? Oh, and don’t kiss anyone. I had the same thing as yours last year, with I also had red eyes. Yep, drops seems to clear up for me. Regardless, I have the same condition today, but in my right eye. Looks like your girl friend socked you one. Ouch! Sympathies Daniel. I’ve had it a few times and it’s never pleasant. My doctor says it basically comes from working in an office environment where it’s transmitted very easily, not to mention air conditioning which doesn’t help causing dry eyes. Also as you may recall in my building there is a Doctor’s surgery on the fourth floor. I’ve taken to pushing lift buttons with my elbow or wrist (never with exposed skin). A friend used to get terrible eyes like that. Turns out he had eyelash dandruff falling in his eyes, so now he has to anti-dandruff his eyes! The eyedrops are called Chlorsig, and it turns out they’re available over-the-counter at pharmacies. Something to remember for the future. They seem to be working, too. Happily I don’t get this sort of thing very often. On a more serious note, if this is conjunctivitis, I’m glad you’ve seen a doctor and received the appropriate medication for it. 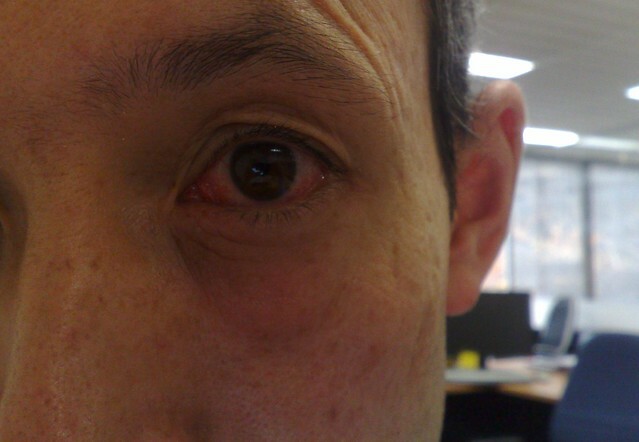 Given that you are using Clorsig (chloramphenicol) eye drops, I’d say you’ve got a form of conjunctivitus. As others have said, easily transferrable, particularly if you are an eye-rubber. You can also get a chlorig ointment, but it’s a little uncomfortable in the eye if you aren’t used to it. Just by chance, I got a dose of conjunctivitis (in my right eye) last week!!! Seriously!!! I got TWO bottles of drops – total cost here in Japan for an Ophthalmologist’s visit and drops Y2200 (AU$23.78)(thanks to all those payments to the Japanese healthcare system).